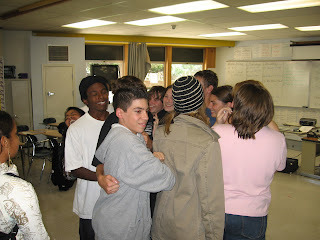 This past Thursday our Academy Junior class took part in some team building exercises. To start off the day we conducted a few experiments to test some theories on learning. Some of the students ended up getting a little wet in the face! Then we did some exercises which gave the students a specific task. To accomplish these tasks the students had to trust each other and rely upon their classmates. This will be extremely helpful for the juniors as they will coordinate several large projects throughout the school year which will require them to trust and depend on each other.